If you believe in the potential of the foldable form factor to revolutionize a stagnant and increasingly boring smartphone industry, you’re probably excited about Samsung’s other product launch scheduled for February 20. But there are actually numerous other companies working on foldable mobile devices of their own, of which one in particular managed to grab our attention a couple of weeks back in a mouth-watering and, frankly, far-fetched hands-on video. Believe it or not, the same exact product is today casually showcased by none other than Bin Lin, Xiaomi’s Co-Founder and President, looking positively dreamy, as well as lightyears ahead of what Samsung demonstrated back in November. Of course, we still don’t know exactly how the Galaxy Fold (or Galaxy F) is supposed to look (or bend) in its final, commercial-ready form. But what Xiaomi has in the pipeline is the world’s first double-folding device, seemingly capable of switching from a tablet-style usage mode to a more practical smartphone-like aspect by bending the top and bottom (or left and right) portions of the screen backwards. Even as a conceptual idea, that sounds pretty bonkers, not to mention incredibly hard to execute and mass produce without major durability concerns. But Xiaomi’s head honcho claims the company has already managed to “conquer a series of technical problems”, including flexible folding screen technology, flexible cover technology, and MIUI adaptation. All that being said, we obviously shouldn’t get too excited just yet, as the droolworthy product manhandled on video by Bin Lin is still very much an “engineering” prototype, with no commercial release plans etched in stone right now. But if the feedback is positive, which seems like a guarantee, Xiaomi will apparently “consider making a mass production machine in the future.” By the way, the potentially groundbreaking device doesn’t have a name yet, with related suggestions welcome. Xiaomi Dual Flex and Mi Mix Flex are Bin Lin’s top ideas for the time being, but if you have a better one, we’re all ears and something tells us the company is too. yeah just display No Camera No IO No FPscanner Nothing. Samsung or pretty much any company can make bendable display now..
Do you know as a fact that it does not have under display fingerprint reader? Its a freaking concept and it definitely will have some kind of camera. Thats a video of a concept that's probably half a year old. True innovation unlike other company giving too high price on their device like s**t. Greediness at finest! Looks interesting but the screen in the back was still on when it was folded and in use. That needs to be fixed or it's just wasting battery for no reason. That's easily solved with software. 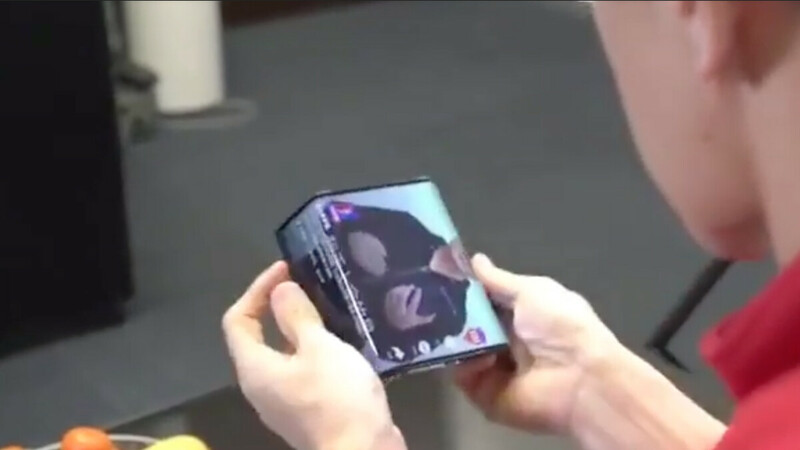 Meanwhile that's a foldable phone I'd buy in a heartbeat. Xiaomi and their Chinese counterparts are way ahead of everyone else in innovation. It's not even close anymore especially compared to a certain company that claims the innovation title by producing the same phone every year and charging more for new emojis. "Meanwhile that's a foldable phone I'd buy in a heartbeat." Except you can't and propably not in a very long time, so there's your innovation. Anyone can innovate, but turning it to ready consumer product is totally different thing You really think Apple doesn't already have something like this in prototype state? Its going on sale this year alongside the Samsung's foldable phone. You will enjoy it in 3 years when Apple copies it as it does with every single thing so far. 3 years after for water resistance, 3 years after for wireless charging, and it will be 3 years after for under display reader. If i want to enjoy that i can just buy it when it's available. By the way still not using wireless charging, neither need for under display reader, i already have better solution. Lmao, you don't have a better solution for either. Sorry, did I hurt your feelings? Lol Xiaomi are one of the few companies that can and will put this into production very quickly. I agree. Everyone said the same when the Mi Mix was a concept, 3 months later and you could actually buy one. Same with the Vivo Nex. Midan is the lead singer of the iFoolz so don't expect anything logical from him unless it's Apple. This just looks better than Samsung's foldable smartphone. Thats for sure and that Royale. Where have you seen Samsung foldable?!?! I'm Interested to see the design, so far there haven't been leaks. You do know chinese screen makers have had foldable Oled tech just as long as Samsung and LG don't you? And neither Samsung or LG has shown off a dual folder so just how did Xiaomi copy their tech? Just add a Oppo Find X motor or something similar to house the camera and sensors. Too much middle finger :))). Literally just a bendable screen from probably years ago.